If it is possible to build a hotel of ice in a small village 200km inside the Arctic Circle, which strikes the whole world with amazement, then anything is possible. 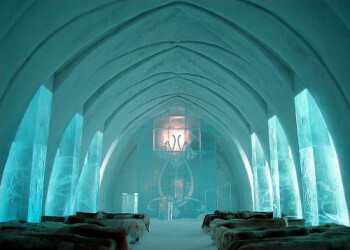 The story of ICEHOTEL is indeed a fairy tale come true. The free flowing Torne River is the origin and artery of ICEHOTEL. From the river, the ice of ICEHOTEL is borrowed each year. And it is here, on the river shores in the village of Jukkasjärvi that our story begins. The company Jukkas (present day ICEHOTEL) has been a tourist operator in the region since the 1970s. For many years the company focus was on the summer season and the magnificent outdoor experiences offered by the land of the midnight sun. During the dark winter the river was frozen and the people of the small village of Jukkasjärvi went into hibernation. By the end of the 1980s it was decided to turn things around. Instead of viewing the dark and cold winter as a disadvantage, the unique elements of the arctic were to be regarded an asset. Inspired by the work of visiting Japanese ice artists, in 1990 the French artist Jannot Derit was invited to have the opening of his exhibition in a specially built igloo on the frozen Torne River. The 60 square metre building named Artic Hall attracted many curious visitors to the area. One night a group of foreign guests, equipped with reindeer hides and sleeping bags, decided it would be a good idea to use the cylindrical shaped igloo as accommodation. The following morning the brave group raved about the unique sensation of sleeping in an igloo. Hence, the concept of ICEHOTEL was born. A lot has happened since. 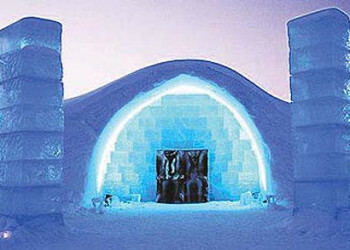 Today ICEHOTEL is world famous for its unique concept, its fantastic works of art and its extraordinary experiences. The fairy tale nature of ICEHOTEL brings out the child in guests of all ages.